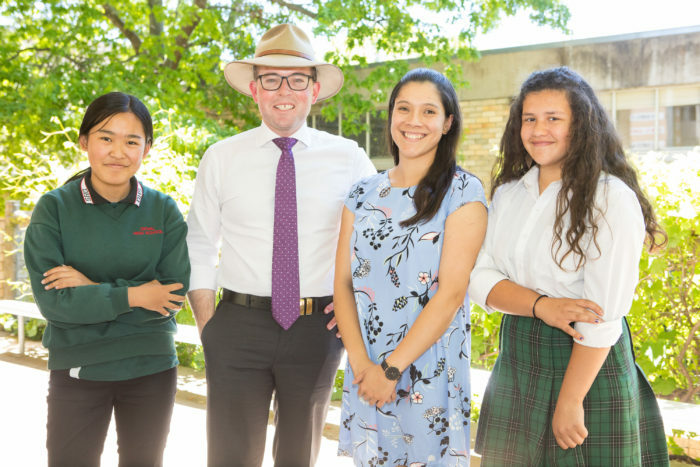 Duval High School student Deemi Dorji, left, Northern Tablelands MP Adam Marshall, Science and Agricultural Technology teacher Bridget-Ann Labrosse and student Talita Craven. NORTHERN Tablelands MP Adam Marshall says an environmental grant awarded to Armidale’s Duval High School will really have the enlarged campus buzzing next year. Mr Marshall today announced a $3,500 grant from the State Government for project that will see the school and its students establish a honeybee garden and hive designed to increase education about conservation but also give them some more entrepreneurial skills that could translate into a sweet commercial stream. The local MP said the Bee The Change project would expand the school’s environmental education and students’ commercial nous. “There’s a real buzz about this bee keeping project – it’s a great little idea and that’s why it’s won this funding – not only will it be fun, but it will be educational and economically attractive for students and the school,” Mr Marshall said. “By establishing a honeybee garden and hive, the students, particularly those studying elective Agriculture, will have the opportunity to learn about the conservation of endangered bees in Australia, the benefits of bees as pollinators of plants and the rewards of honey production. Duval High Science and Agricultural Technology teacher Bridget-Ann Labrosse says the project will get underway next year. “We’re unsure at this stage whether or not the hive will be in a fixed location or whether it will be moved around to different areas of the school throughout 2019 and then 2020,” Ms Labrosse said. “This will determine whether we have one bee garden or multiple ones set up around the school in order to support the hive if it needs to be moved to various locations. “The bee gardens will consist of above ground garden beds to support bee populations we hope to attract and foster on school grounds. Mr Marshall said the project will also see support mechanisms in place for the bees, including bee baths and pollinator hotels made from recycling timber materials, which might also see some cross-curriculum involvement with Duval High’s wood technology classes and also food technology students. “The school is looking at the suitability of a course that teaches students about bees and honey production, pollination and sustainable ecosystems in Agriculture and Science classes,” Mr Marshall said.